Žabiny Brno point guard Karolína Malečková fights through the defensive pressure of Lenka Bartáková during Game 2 of the exciting All-Brno ŽBL semifinal series. Photo credit: Žabiny Brno. Brno, Apr. 3 (BD) — egoé Basket Brno returns home to play Svitavy tonight, HC Kometa draw regular-season champions Liberec in semifinals, Zbrojovka Brno goes for four out of five when it hosts Ústí nad Labem on Sunday, Draci sweep Technika to start baseball season, Brno Alligators start the American Football season at Pilsen Patriots on Saturday, Dragon Rugby welcoms Říčany to Brno on Saturday, Lokomotiva rests up for season-deciding game against Hradec Králové, Volejbal Brno – Women and Men — end seasons in quarterfinals, and the Brno sports results and schedule. KP Brno fought off elimination in Game 3 of the ŽBL semifinals when they beat crosstown rival Žabiny Brno, 72-57, at home on Tuesday night. Žabiny Brno leads the best-of-five series, 2 games to 1. With a season-ending sweep as a serious possibility, Stará took control of the KP Brno offense and went off for a game-high (and season-high) 26 points. She was 9 of 15 from the floor, including 4 of 8 from long-range. Lenka Bartáková added another 14. Game 4 will be hosted by Žabiny Brno on Thursday at 5 p.m. If KP Brno wins, they would force Game 5 in Kralovo Pole on Saturday. Marques Webb had another solid game for Žabiny Brno in Game 3, scoring 18 points and grabbing 12 rebounds. Last week, Michaela Vacková led Žabiny Brno to a 61-73 victory in Game 1 with a season-high-equaling 22 points and 14 rebounds, which was a tick away from that season-high total. She was a lights-out 6 of 7 from 3-point range. In Game 2, Vacková again had a double-double with 13 points and 10 rebounds, but Webb really controlled the paint as Žabiny Brno won, 74-56. Webb had a season- and game-high 24 points, and nine rebounds. Perhaps most importantly, Webb was a confidence-building and momentum-keeping 12 of 15 from the free-throw line. Nikola Dudášová, who started and never left the court, had 18 points. It was a big jump forward to win the first two games, especially for a team that was had recently lost its two top scorers: Kateřina Zohnová (12 points a game) broke her arm before the series began and Petra Záplatová (12.8) succumbed to an Achilles Tendon injury after Game 1. As expected, league superpower ZVVZ USK Praha swept Sokol Nilfisk H. Králové in the other semifinal series. Last year, KP Brno made it to the finals and lost to Praha. There are two Brno women’s basketball teams in the semifinals of the ŽBL, but the leading female scorer in the city doesn’t play for either. 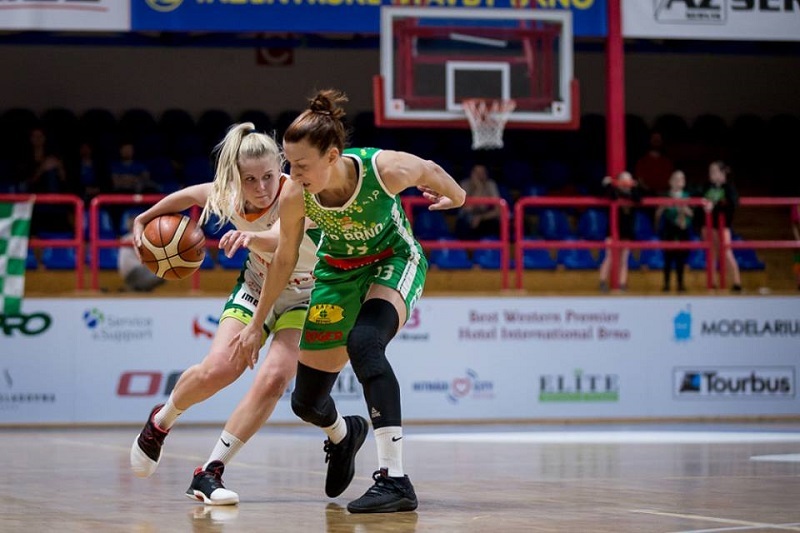 Tereza Zítková, who averages a Brno-best 13.6 points per game, surpassed her average when she led Teamstore Brno to a 52-78 victory at U19 Chance on Sunday and guaranteed that the team would remain in the top women’s basketball league next season. Zítková is ninth in the league in scoring. Teamstore Brno (3-20) has one game left this season. They host U19 Chance (1-22) today (Wednesday) at 8 p.m.
Reggie Keely was back on the floor for egoé Basket Brno after a prolonged injury absence, but even having the full team back and healthy was not enough to stop its losing streak. Brno has lost nine games in a row, all of them since starting play in Group A1 with two wins and high hopes. Last week, Brno lost at Sluneta Ústí nad Labem, 86-73, on Wednesday and at BK Opava, 91-63, on Saturday. After five road games, egoé Basket Brno (10-23) finally returns home to Campus Square to play second-place Dekstone Tuři Svitavy (21-12) today (Wednesday) at 8 p.m.
egoé Basket Brno is eighth in the Group A1 standings and, after the three remaining games in Group A1, it will play in the Pre-Play-Off Series against either USK Praha and Geosan Kolín, who are tied at the top of the Group A2 standings. The best-of-three series will reward the winner with a spot in the main Play-Off Bracket. As the saying goes: If you want to be champion, you have to beat them all. For HC Kometa that means facing regular-season-champions Bílí Tygři Liberec in the semifinals. In head-to-head competition during the regular season, Kometa lost to Liberec, 2-5, 5-2, and 1-2, before winning 3-2 in a shootout in Week 50 as part of the Brno resurgence that has resulted in a dominating record of 11-2 in the last 13 games. The semifinals are a best-of-seven series that begins in Northern Bohemia with Game 1 on Wednesday (5 p.m. start) and Game 2 on Thursday (7 p.m. start). The series shifts to the shore of the Svitava River and DRFG Arena for Game 3 on Sunday (5 p.m. start) and Game 4 on Monday (7 p.m. start). If necessary the series will continue April 11 (in Liberec), April 13 (in Brno) and April 15 (in Liberec). HC Kometa swept Hradec Králové in four games to advance to the semifinals; they have rested since March 23. Liberec, which finished atop the regular-season standings, advanced by beating BK Mladá Boleslav, four games to one. Kometa swept Liberec in the 2017 Finals to win their 12th league title and first since 1966. Since then, Kometa defended its title by beating Třinec four games to one in 2018. In both postseasons, Kometa went 12-2. The 2019 postseason team has so far been led by Jakub Orsava (four goals, one assist), Peter Meuller (four goals, one assist) and Martin Zaťovič (three goals, two assists). Jan Hruška (one goal, five assists) has the most posts for his assists. Goalkeeper Marek Čiliak had a shutout in Game 1 and has given up a total of four goals. The best-of-seven finals will be from April 18 to 30. With their ninth point in four games during the spring half of the Fortuna:Narodni Liga season, FC Zbrojovka has scratched its way back into contention for a chance to return to the top Fortuna:Liga at the end of the season. On Sunday, Zbrojovka beat Prostějov, 1-0, when Lukas Magera came off the bench at halftime. In the 59th minute, Pavel Eismann centered a brilliant pass across the mouth of the goal to the far post, where Magera headed the ball for his 11th goal of the season and, perhaps, redemption for a penalty kick that he missed two weeks ago in the second-half collapse at league-leader SK Dynamo Č. Budějovice. FC Zbrojovka (9-5-6 with 32 points) is in fifth place courtesy their 37 goals scored, just a tick ahead of the sixth-place FK Pardubice (8-8-4, 32 points, 33 goals scored) and FK Ústí nad Labem (10-2-7, 32, 26) and just five points behind third-place FC Hradec Králové (11-4-5, 37, 26) and fourth-place FK Varnsdorf (10-7-3, 37, 19). It’s not surprising but Brno Draci, the 21-time champions of Czech baseball, beat crosstown rival Technika three times during Opening Weekend. The Draci, as usual, maintained a solid foundation of pitching and built solid offensive performances on top. They are the only team to go unbeaten during the first weekend. On Opening Night, Brno Draci beat Technika, 8-0, behind three pitchers. Ondřej Furko struck out nine in five innings. Petr Minařík struck out another two in two innings. And Peter Moylan, a former Major Leaguer, made his Czech extraliga debut with two shutout innings in relief. In all, Draci outscored Technika 25-5 in the three games. Cardion Hroši Brno won one of three games against Olympia Blansko. The victory, an 8-0 result on Saturday, was behind a huge pitching performance. Steven Chambers threw six innings of hitless baseball (with seven strikeouts) and Petr Novotný finished the game with three innings of one-hit shutout baseball. The Sígrs and the Alligators will both represent Brno in the newly named Paddock League. The Brno Alligators start the season on the road against the Pilsen Patriots on Saturday at 2 p.m. The Brno Sígrs will start a week later when they host the Vysočina Gladiators at Ragby Bystrc on Sunday, April 14. The Brno rivalry will be played out twice: May 3 and June 22. RC Dragon Rugby started the 2019 season at RC Sparta Praha on Saturday and lost 59-12. Brno will have its first home game next Saturday when it faces RC Mountfield Říčany. The game starts at 11 a.m. at the field at Cacovice 9 in Brno-Maloměřice. Seventh-place FC Lokomotiva-Horni Herspice (2-3-7, 9 points) gets a week off to prepare for an important game against eighth-place FC Hradec Králové (3-0-9, 9) on April 13 at 11 a.m. The loser could very well be the team that will be relegated from the top women’s league at the end of the season. So far during the spring half of the season, Lokomotiva has tied Plzen and lost to SK Slavia Praha in league play. The final Lokomotiva league game will be at 1. FC Slovácko (4-1-7, 13) on April 21 at 4 p.m.
Volejbal Brno-Women fought to the very end, but they could not get past the PVK Olymp Praha and lost a competitive match and an exciting series in the final, tiebreaking set 20-25, 25-19, 22-25, 25-18, 15-7. PVK Olymp Praha, which entered the series as the favorite, rebounded from a 1-2 deficit in games to advance, 3 games to 2. Volejbal Brno finished the regular season in fifth place, just behind Olymp and just ahead of KP Brno, which was swept in the quarterfinals last week. The Volejbal Brno men’s team, similar to the women’s team, had a 2 games to 1 lead over a higher-seeded team in the men’s volleyball extraliga quarterfinals, but, like the women’s team, they could not win the deciding match and Kladno volejbal will advance to the semifinals. Brno lost Game 5, 25-23, 25-19, 23-25 and 25-21. — Men’s Basketball: egoé Basket Brno X DEKSTONE Tuři Svitavy, 8 p.m.
— Women’s Basketball: Teamstore Brno X U19 Chance, 8 p.m.
— Hockey (Semifinals, Game 1): Bílí Tygři Liberec X HC Kometa Brno, 5 p.m.
— Women’s Basketball (Semifinals, Game 4): Žabiny Brno X KP Brno, 5 p.m.
— Hockey (Semifinals, Game 2): Bílí Tygři Liberec X HC Kometa Brno, 7 p.m.
— Baseball: Technika Brno X Cardion Hroši Brno, 5 p.m.
— Baseball: Draci Brno X Tempo Praha, 7 p.m.
— Baseball: Tempo Praha X Draci Brno, 2 p.m.
— Baseball: Technika Brno X Cardion Hroši Brno, 2 p.m.
— American Football: Pilsen Patriots X Brno Alligators, 2 p.m.
— Men’s Basketball: Olomoucko X egoé Basket Brno, 6 p.m.
— Baseball: Cardion Hroši Brno X Technika Brno, 2 p.m.
— Hockey (Semifinals, Game 3): HC Kometa Brno X Bílí Tygři Liberec, 5 p.m.
— Hockey (Semifinals, Game 4): HC Kometa Brno X Bílí Tygři Liberec, 7 p.m.
— Baseball: Olympia Blansko X Draci Brno, 7 p.m.
— Women’s Football: Lokomotiva Brno H. H. X FC Hradec Králové, 11 a.m.
— Baseball: Skokani Olomouc X Technika Brno, 1 p.m.
— Baseball: Draci Brno X Olympia Blansko, 2 p.m.
— American Football: Brno Alligators X Pardubice Stallions, Ragby Bystrc, 2 p.m.
— Brno Half Marathon, 11 a.m.
— Men’s Football: Táborsko X Zbrojovka Brno, 4:30 p.m.
— American Football: Brno Sígrs X Vysočina Gladiators, Ragby Bystrc, 2 p.m. The Brno Sports Report is published every Wednesday. All dates and times are subject to change. Most of the stories are about the traditional “English-speaking” team sports — football, hockey, baseball, basketball, American football, cricket, rugby, etc. — but it is also about the interesting local spectator and participation sports — tennis, badminton, running, horse racing, swimming, rock climbing, biking, etc. If you have any suggestions for what should be included, please comment below or send an email to brnosports@gmail.com.